American Gutters has been a Locally Owned Business and for over 20 years, Owner Keith Chapman is no stranger to the Keystone Heights community, and has built a reputation that stands tall in Clay, Bradford, Putnam, and Alachua Counties. Stop in and talk to Charlie, the Sheds and Carports Sales Rep. He can help you find the Shed, Carport, Steel Building, Horse Barn, Pole Barn, Gazebo, Pumphouse, or Doghouse you need. And if you see Keith out front grilling that means he is having a SALE/BBQ – Definitely stop in for that! 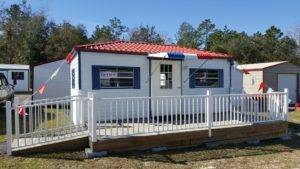 *Shed sales and delivery servicing Keystone Heights, Starke, Palatka, Waldo, Gainesville, Green Cove Springs, Middleburg and all the surroundings area.